We experienced a big outage yesterday. Cisco patches were applied, the big VMWare boxes came back up, NetApp Storage were restarted, database servers brought online, Application & Web Servers rounded up the corner mile. But not so fast with the IIS Web Servers in our QA environment. The Web Server is running on Windows 2014. And, for each Web Site the corresponding “Application Pool”. But, upon launching a browser and accessing the web site locally on the box itself, no smoke. Countless episode with Event Viewer yielded no redemptive clue. 6038 Warning LSA (LsaSrv) Microsoft Windows Server has detected that NTLM authentication is presently being used between clients and this server. This event occurs once per boot of the server on the first time a client uses NTLM with this server. 5010 Warning WAS A process serving application pool ‘DefaultAppPool’ failed to respond to a ping. The process id was ‘###’. 10149 Warning Windows Remote Management The WinRM service is not listening for WS-Management requests. Account name: IIS APPPOOL\DefaultAppPool. Cannot open database “HRDB” requested by the login. The login failed. Login failed for user ‘LADBDOMAIN\IIS01$’. Knowing that we had problems with the Network earlier took to the Net and tried to access external hosts on the Net. No problem. Knowing that this computer is not playing with me, finally took to the command line, knowing that I might as well get bruised up and have something to show the judge, so that she might as well call it even. Netstat to the rescue. By a wide margin, netstat is my favorite command line network diagnostic tool. From command line, issued “netstat –an | find “SYN_SENT” “. Seeing that we have SYN_SENT to port 1433, I sensed that we have a SQL Server Connectivity issue. By default SQL Server runs on Port 1433. But what host. Yes, I know IPV4, but IPV6. That is way after my time. Thankfully, got back the hostname. And, it is in fact the Hostname to our SQL Server. IIS pings a worker process periodically (by default, every 30 seconds) to make sure it is still responsive. 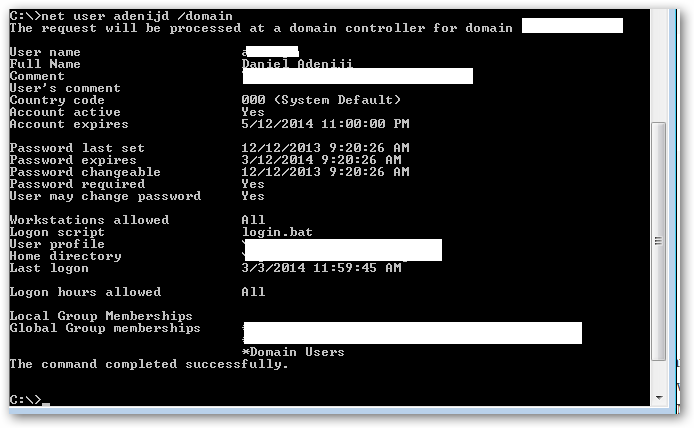 It is possible that your worker process is too busy to respond to the ping, so IIS tries to terminate it. When IIS tries to terminate the process, it fails, because the process is still hanging on to areas of memory. Go into IIS, click Application Pools, then right-click on your app pool and choose Advanced Settings. Under the Process Model heading, choose False next to Ping Enabled and see if that fixes the issue. Another option is to increase the Ping Maximum Response Time. As for whether or not this signals a larger problem, I would say yes, it does. It doesn’t seem appropriate for that type of code to execute synchronously. You might want to consider passing the task off to a Windows service that will do an async callback, or investigate IIS’s async model (System.Threading). How to do that would probably be a better question for stackoverflow. The advantages of PathPing over ping and traceroute are that each node is pinged as the result of a single command, and that the behavior of nodes is studied over an extended time period, rather than the default ping sample of four messages or default traceroute single route trace. The disadvantage is that it takes a total of 25 seconds per hop to show the ping statistics. Lost my mind @ 11:30 PM. Just because the IP Address was an IPV6. Commuted over to the SQL Server box, noticed the SQL Server Instance was stopped, restarted it. Now I can get on that last train! One of the things I like about OS/X and Unix is that one gets in the habit of doing many things through the command line. Whereas in Windows, one will use a GUI to get quick information. But, truthfully Microsoft has many facilities for accomplishing things through the command line, or shall we say terminal mode, as well. In the Valley, the saying goes “Got tired of patch Tuesday, and so went Goggling“. But before you go, you can at least give Street Creds to Redmond, also. net user "<AD Account>"  /Domain | find "Group"
net user "danieladeniji"  /Domain | find "Group"
The net view commands lists the shared resources on a remote machine. A good friend texted me last week saying that upon the family upgrading to AT & T \ SBC U-verse one of their laptops is no longer able to connect to the Internet. That is two of three computers are able to connect, but one last lone laptop is not. He is a good friend and he is computer savvy. And, I know he would not contact me unless he is tried and he really needs the help. And, so he volunteered to bring the computer over, but I know it would not really help; as I needed to observe the interaction between his laptop and and the wireless access point. But, first I had him connect the laptop to the Wireless Access Point via a Network Cable and that worked. Had a chance to think it over this last weekend and so was happy when he called that he will come by on Sunday evening. Outside of watching “60 minutes” on CBS, my Sunday evenings are free. Once he brought the computer by, I went to Control Panel \ Devices and checked the date-stamp on his Wireless Device Driver. Sojourn to the VistaDrv folder and run the setup.exe. 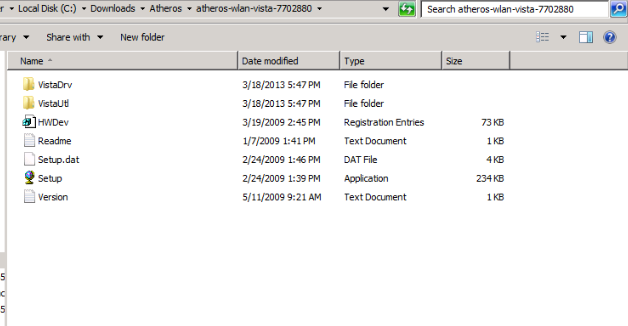 Once installed, revisit Control Panel\Device Manager and validate that your Atheros Wireless Driver is now 7.7.0.288 or later. It all started one Saturday morning, actually this morning (Sat 2010-10-02) to be exact. A friend’s HP Pavilion hard-drive crashed and a new drive had been placed in for a couple of weeks now. But, only now completed MS Windows XP install. Only God knows how long it takes to apply all the security patches one has to download and apply these days. Anyways, most everything was done. But, still there was a yellow exclamation mark that wouldn’t budge in the Control Panel \ Device Manager applet. Visited HP’s Support site numerous times to see if I could find a matching driver, but no luck. Reviewed, the Product Specifications – HP Pavilion a847c Desktop PC Product Specifications (http://h10025.www1.hp.com/ewfrf/wc/document?docname=c00280716&cc=us&dlc=en&lc=en&jumpid=reg_R1002_USEN), but very little detail regarding the Networking “elements”. The specification per-functionary makes mention of “Network (LAN) – Integrated 10/100 Base-T Networking Interface”. And, that is it. but, even after downloading the driver, extracting the zip file, the extracted files lacked an install program (setup.exe) and the accompanying documentation yet failed to draw us any closer to knowing if we had the needed files. to dead ends. It appears that the driver is not publicly published, nor supported by the Vendor. Googled some more and found a couple of Applications that would detect the “unknown devices” and match them with corresponding drivers. Some of the Applications that were downloaded and tried are: DriverMedic and Unible – DriverScanner. But, as they were both commercial applications, could least afford them; at least on a broke Saturday morning ( on the 2nd day of October). After much searching found the drivers on DriverGuide (http://members.driverguide.com/driver/detail.php?driverid=704874). Yes, had to endure and click through about 15 advertisement pages, but as long as I hard searched it was worth it. Once the compressed\zip file is downloaded please extract it and return to MS Device Manager where will be able to affix the newly downloaded drivers to the “Ethernet Controller”. So that is the long story. A shorter story and possibly more official driver can be gleaned from this next paragraph. Transact package threw an exception. Windows Error Text: The network name cannot be found. Yours may be different, depending on what is listed under Network, in the “Parameters” tab of your “IP Address” resource. Note, that is available through the Cluster Administrator.